Happy November Yogis! This month of gratitude offers so much to celebrate. The weeks leading up to Thanksgiving are filled with almost constant reminders to be thankful and open-hearted. Like our yoga practice, gratitude has a balance all it’s own. Sometimes it flows fully and freely, other times, it builds starting slowly and gradually gaining strength. Understanding these personal nuances becomes more apparent with regular practice. Frequent tending and exploration yields rich and insightful results on the mat or in your heart. I couldn’t think of a better way to cap this four pose series and celebrate over a year of posts, than with a big heart opener. This posture is a big back bend like Ūrdhva Dhanurāsana or Upward Bow, but it requires even more participation from the shoulders. It’s also necessary to be mindful of the neck as you are placing the crown of the head to the earth. The preparatory work that we’ve done with Śīrṣāsana, Aṅjaneyāsana, and Supta Vīrāsana will get you ready to explore this pose. There are several ways to get into this pose. A more traditional approach would be to come to Upward Bow and then come to the elbows. However, since I am less mobile in the shoulders this entry has always been more challenging for me. I found that if I enter via Śīrṣāsana and use the wall, I can slowly coax my shoulders to open and be prepared for the back bend. The Śīrṣāsana entry also provides that exhilarating moment where you have to take a leap (okay a reach) of faith before your foot finds the wall or the earth. Option 1 – Śīrṣāsana with Hanuman Legs at the Wall. Place your mat with the short side against the wall. 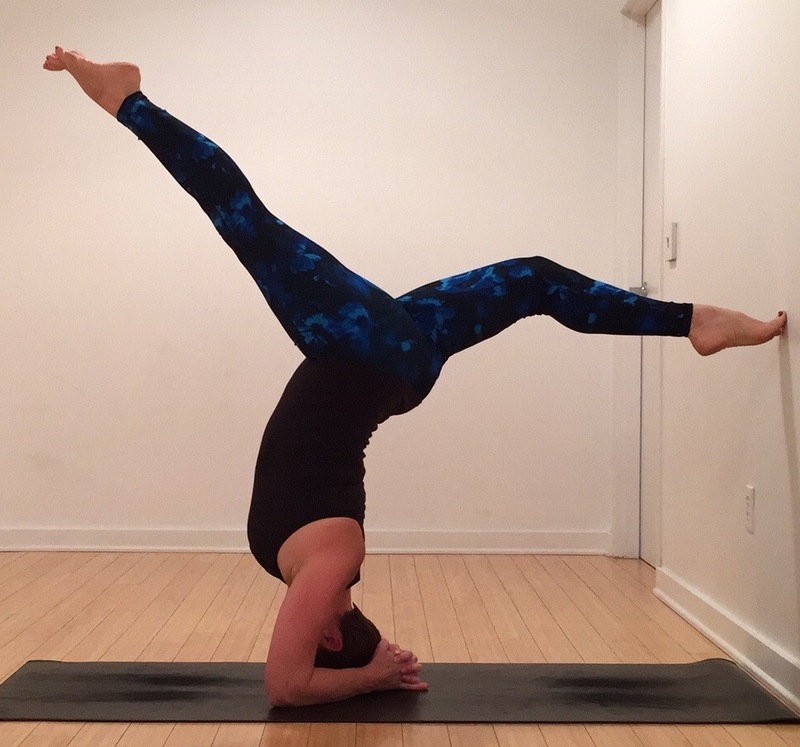 Position your headstand, so that you are at least one foot away from the wall. (As you move into this pose, be very aware and cautious of the neck. If at any time, you feel the neck is compromised or your forearms and shoulders are not providing enough support come out with control right away.) Come into headstand and pause, us the structure of the arms and shoulders so the crown of the head is bearing little or no weight. Separate the legs and reach one foot towards the wall without disrupting the stability of upper body. With a foot on the wall, reaffirm the pressure of the forearms and lengthen through the spine. Take a few breaths and then switch legs. As you become more confident and stable, move further away from the wall until you reach the distance of about 3 feet or more away. Option 2 – Two Feet on the Wall. Try this next stage when you feel stable and confident in Option 1. Slowly, take the second foot to the wall. Press into the balls of the feet and spin the inner thighs towards the floor. Hollow out the armpits and reach the front of the heart away from the wall. While pressing the forearms into the mat, lengthen through the spine, reaching the tailbone to lengthen out of the low back. 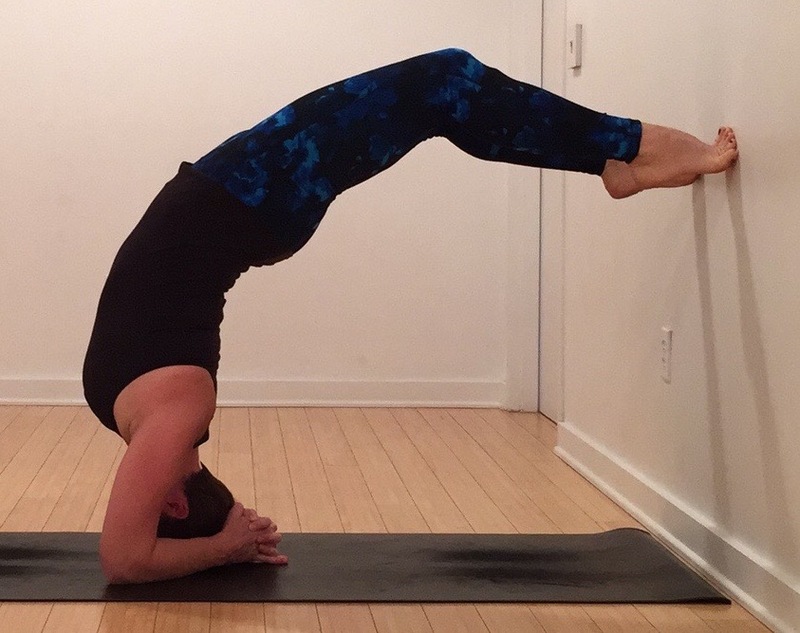 Take a 5-10 full breaths, then slowly exit the pose by reaching one foot away from the wall and towards the floor. If you feel any discomfort in the neck, shoulders, or back, slowly back out to lessen the back bend or come out of the pose all together. Option 3 – Walk Down the Wall. First, ensure that you are far enough away from the wall. When you are further away, the initial reach of the foot toward the wall may feel like a leap of faith. But, as you walk the feet further down the wall, you will be thankful for the extra space that allows for a longer back bend. Slowly, walk the feet further down the wall. 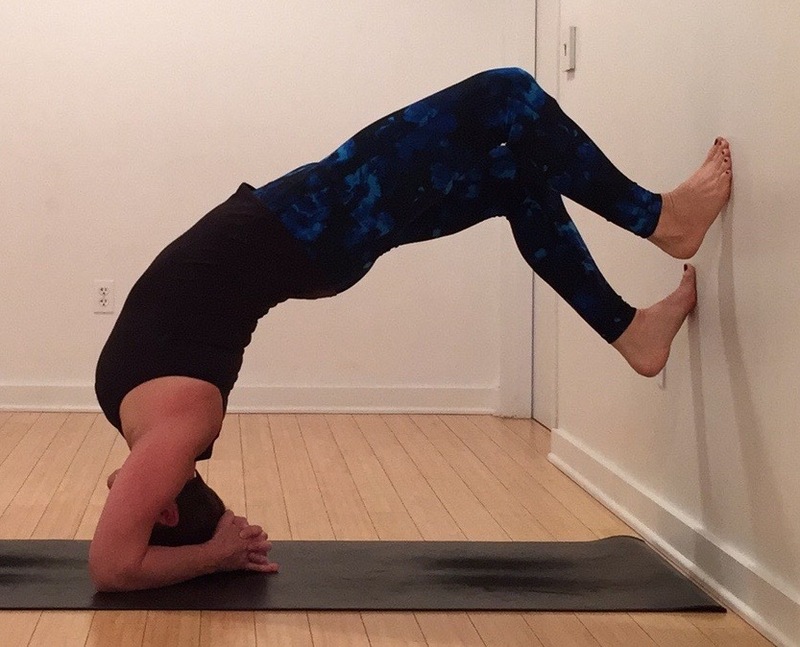 Each time you go deeper, pause, reaffirm the shoulders, length of the back and press of the feet into the wall. If you feel you have more space or are ready for more challenge, then walk the feet further. Keep working this walk down the wall until you can comfortably walk the feet all the way to the floor. As the back bend increases the elbows may want to lift from their grounded position. If this happens, more shoulder opening is needed. 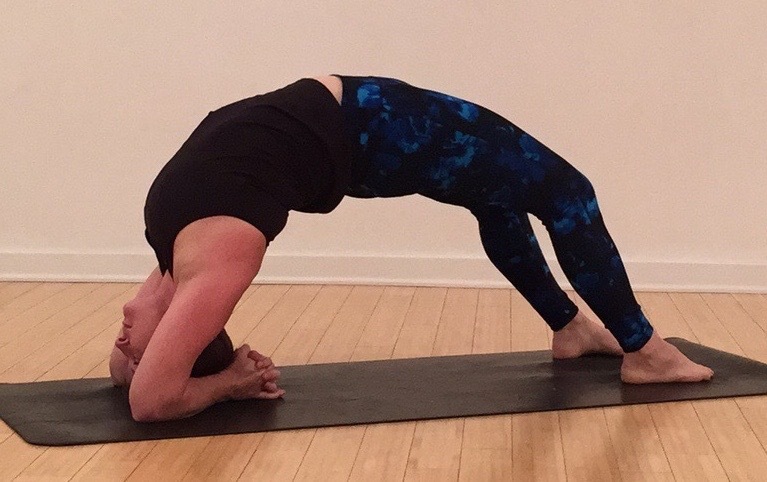 Take time to work in a less intense back bend and other shoulder openers before you proceed. Option 4 – Dwi Pāda Viparīta Daṇḍāsana. As you practice at the wall, gradually move your starting point further and further back. Over time you will become more controlled and at ease with the reach of faith to get the foot to the wall. When you’ve developed the shoulder and back mobility to comfortably walk your feet all the way to the floor you may be ready to try the transition without the wall. It’s helpful to have an experienced instructor assist you the first time you transition from Śīrṣāsana to Dwi Pāda Viparīta Daṇḍāsana. Spotting the transition can help you to remain calm and in control of the transition. When you build up the confidence, make the transition on your own, moving slowly and mindfully. When the feet find the floor, press firmly into all four corners of the feet, paying special attention to the big toe ball mounds. Roll the inner thighs toward the midline and towards the ground. Hollow out the armpits and press the heart through the opening of the arms. To exit, release to your back and pause. Whether you are ready to bust your heart open or if you need to ease into it, work where you can find the right balance of work and ease, making sure to keep the body safe. Follow this #PowerPose challenge @suzannewrightyoga on Instagram or at Suzanne Wright Yoga on Facebook. If you post your pictures or about your experience be sure to tag #PowerPose and @suzannewrightyoga.